We have been busy little bees around here this week. Yesterday, Jackson had his Breakfast with Mom gathering. It was so fun to watch the children interact, so completely different than how they were at the beginning of the year. They were all running around the room, trying to chase one another, lots of laughing and giggling. They did a short song, which Jackson wanted no part of. The first half of the song, he stood there playing with his belly button, and the second half, he stuck his tongue out as far as humanly possible! 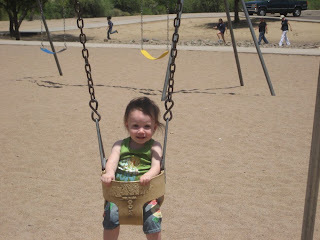 Today we went to the park with the Preschool Mommies. It was a lot of fun! Tyler, sat and played in the sand for a good 20-25 minutes, which is a LONG time for her. Tamara said that children who play in sand will be good at math and science, LUCKY HER, because I don't think Jackson got any of those math skills that I have tried so desperately to pass along! Jackson shared his remote controlled car with his friends very well, I was quite please with today's outing. Especially because I even captured a picture of Tyler smiling on the swing, SHOCKING! I know it may not look like much, but some days that is as close as you get! 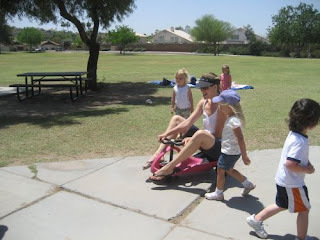 I think my favorite moment of the day was watching 6 foot something Tamara ride the Plasma Chair thingy, I only call it that because I don't know what it is really called, but she was a great sport, trying to catch her daughter on it. Was probably even more hilarious because there wasn't a slope to the sidewalk at all!!! What a fun day! Tyler looks like such a big girl and it looks like such a fun group of friends for Jackson. Wish we were there! Love you! O.k. i have to have this photo...what a riot. I had forgotten all about it. Thanks for letting me make an appearance on your blog!